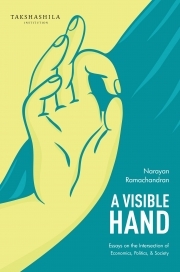 Description of "A Visible Hand"
A Visible Hand is a collection of essays by Narayan Ramachandran. This collection is from a regular column called “A Visible Hand” that Narayan writes for Mint, India’s second largest business daily and longer essays that he has written for Pragati - The Indian National Interest Review. His columns offer a perceptive and original take on many aspects of emerging India-- from the political economy to new-age industries, from financial inclusion to the goods and services tax. Written with depth and his trademark incisiveness, these essays reflect Narayan’s love of words and the English language. They are sure to inform and entertain anyone curious about contemporary India. Narayan Ramachandran is the father of two girls; husband of a writer; social entrepreneur, columnist, and emerging market investor. He worked on Wall Street for 20 years, most recently as Head of Emerging Markets at Morgan Stanley; and Country Head - India for the same bank. He is currently Chairman of RBL Bank; co-founder and Fellow at the Takshashila Institution; and co-chair of Unitus Capital. He serves on the strategic advisory board of L Capital Asia, and on the board of Arghyam, India’s largest foundation dedicated to working on water and sanitation. Reviews of "A Visible Hand"